North America is home to seven species of grebe (futen in Dutch), of which two are common in Michigan: the pied-billed grebe (dikbekfuut) breeds here and the horned grebe (kuifduiker) is a regular visitor during spring migration. I’ve seen and photographed both in Ann Arbor. A red-necked grebe in breeding plumage (from public-domain-image.com). A few weeks ago, reports came in through eBird and a local mailing list about a red-necked grebe (roodhalsfuut) near Nichols Arboretum. This grebe is only a rare visitor to southern Michigan and I had never seen it anywhere, let alone in Ann Arbor. On my way home from work that day, I took a detour through the Arb, but the grebe was nowhere to be found. I tried again the next day, and the next, but to no avail. Such is life: sometimes a rare bird is easy to find, often it’s not. A few days later, another red-necked grebe (or perhaps the same one; who knows?) was spotted a few miles donwstream from the first location. This required a somewhat longer detour on my way home from work, but I figured it would be worth it if I could find the bird. Alas, this time I arrived about 15 minutes after the grebe had flown off to an unknown destination. 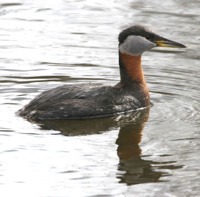 Yesterday afternoon, a report came in of yet another red-necked grebe in Ann Arbor. Melissa and I had been working from home to allow a plumber to install a new water heater. When the plumber left, the grebe offered a convenient excuse to take a quick break from circumstellar disks and embedded protostars and go for a walk in Gallup Park. There were at least thirty different species of bird, but again, no sign of the much-coveted red-necked grebe. As a consolation prize, we did find two other uncommon birds: a common loon (ijsduiker) and two green-winged teal (Amerikaanse wintertalingen). I still wasn’t about to give up, so this morning I left home a little early and biked through Gallup Park on my way to work. My perseverance paid off, because I finally found what I was looking for! I actually found two red-necked grebes together, one still in winter plumage, the other molting into breeding plumage. They were too far away for pictures with my small camera, but close enough for good looks through my binoculars. As an added bonus, Gallup Park turned out to be full of uncommon waterfowl today: I also spotted yesterday’s common loon, two blue-winged teal (blauwvleugeltaling), an American wigeon (Amerikaanse smient), and no less than ten northern shovelers (slobeenden). Sometimes birding is all about being at just the right place at just the right time!